A: I think that to answer this question we need to distinguish the doctrinal principles from the historical practice, as both have influenced how the rites have developed. We will also limit ourselves to the basic rite itself, leaving for some other time the history of reception under both kinds and the posture of the faithful. With respect to practice, however, things developed in a different way. Practically all early documents attest to the practice of Communion during Mass. St. Justin (100-165) mentions that the deacons even brought Communion to those absent after the celebration was over. However, over time the discipline slackened and less and less faithful received Communion. This happened with surprising rapidity as even St. John Chrysostom (349-407) complained, “In vain we stand before the altar, there is no one to partake.” The Church had to recall the importance of receiving Communion even to clerics. From the fourth century on we find decrees making it obligatory for clerics who attend a solemn Mass to receive Communion. The situation reached such a point that in 1123 the First Lateran Council found it necessary to prescribe confession and Communion at least once a year for all Catholics as an absolute minimum. This law remains in force today although actual practice varies widely. The reasons for the faithful’s refraining from receiving Communion are complex, and some reasons are specific to certain epochs. One example is the reaction to Arianism in the earlier period which gave rise to a highly exalted vision of the Eucharist as the “awesome table of the Lord,” which one feared to approach. 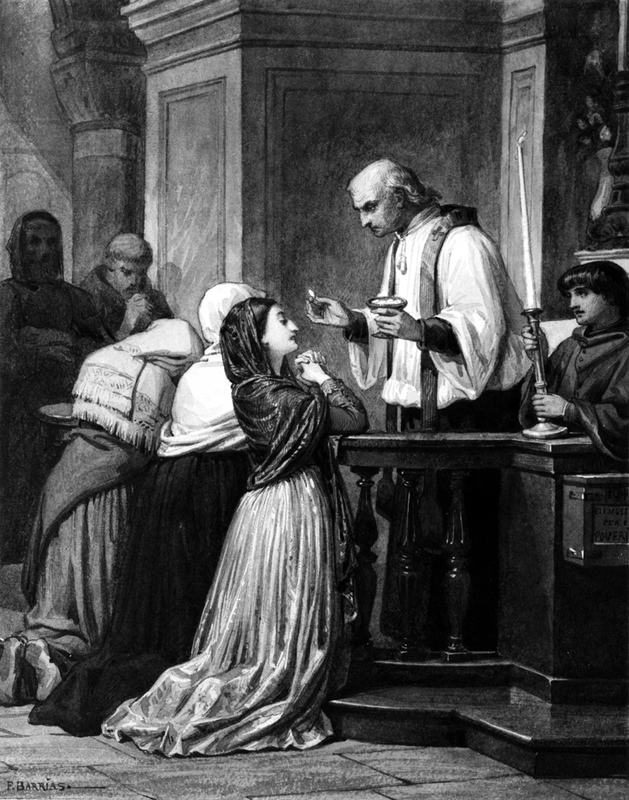 Later during the medieval period a more restricted practice of penance before Communion, detailed rules regarding extended fasting, and recommendations regarding abstention from marital acts before Communion produced an overall cumulative falling away from reception even though Mass attendance remained constant and religious fervor remarkably high. Even the increase in Eucharistic adoration in the 12th century led some to consider that gazing upon the host could in some way replace the sacramental reception. This led to development in the rite of Communion although the possibility of distributing Communion at this moment always remained part of the rite, and it continued to be used whenever there were relatively few communicants. Earlier forms of the Roman rite had a very brief invitation to the faithful to approach Communion after the priest had received. However, this formula disappeared although a bell was rung as a sign of invitation. In the 12th century in some places a kind of introduction returned, inspired by the rite of Communion for the sick, as it became a practice to say a second Confiteor if anyone beside the priest was to receive Communion. And in the 15th century the practice of showing the host to the people with the formula “Behold the Lamb of God …” and the “Lord I am not worthy …” was introduced within the Mass. Officially these formulas were initially accepted in the Ritual of Paul V in 1614 as part of reception of Communion outside of Mass. In practice, however, since during several centuries the mass of the people would receive their yearly Communion around Easter, this led to many logistical difficulties for distributing it during Mass. This lead in many places to a dissociation between the moment of Communion and Mass. In some places there would be priests distributing the Easter Communion from a side altar throughout Mass as well as before and after Mass. This practice was sometimes extended to other major feasts. Gradually, however, there was a return to more frequent Communion, especially in the 19th and 20th centuries, spurred on by several spiritual associations, the increase in the devotion to the Sacred Heart, and the encouragement of the popes. This led naturally to a return to better liturgical practice and the habitual distribution of Communion within the context of Mass, although in some places other practices continued as customs.